Since the news media seems to think this Google Earth border data error is a big deal, I thought I would try to find out where the border is supposed to be. 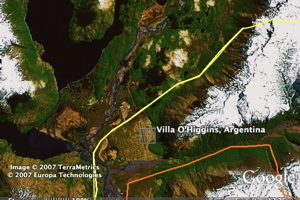 The point of contention is that a town in Chile called "Villa O'Higgins" is shown in Google Earth to be in Argentina. 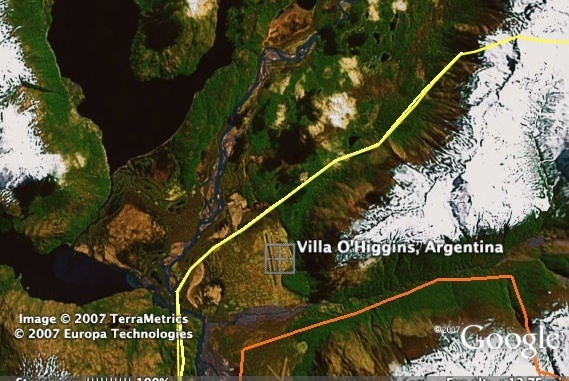 The border in Google Earth is clearly wrong, and the search results also show "Villa O'Higgins, Chile" to be in Argentina. I looked around for a detailed enough map to show the border in this area. Ultimately, I ended up trying Virtual Earth from Microsoft. The roads and cities information are almost non-existent in this area, but the border detail is pretty good in Virtual Earth (or Live Maps - or whatever they are calling it these days). I then created a Google Earth map showing the current border (in yellow) in Google Earth, and then I estimated the correct border position (in orange) based on the VE map (as well as other maps I found). Here is the same map in Google Maps. The data source Google is using for the border in Chile is apparently pretty low resolution. I suspect they just need to acquire border data with higher resolution (and better accuracy) and this problem (and probably others for the area) will be greatly reduced. The thing everyone should realize is that Google isn't intended for survey-level accuracy on things like this. But, I guess with the huge popularity of Google Earth, you have to expect people are going to hold it to a higher standard. Apparently AIM, AOL's instant messenger, has an open API allowing developers to develop interesting applications using anonymous chatter information. 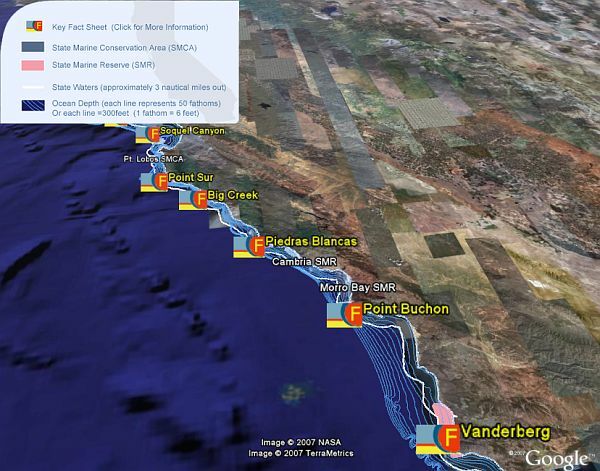 The AIM host team has developed a couple of interesting Google Earth files showing real-time information from AIM users. The first is a network link which shows you the connections between chatters started during the last minute. NOTE: - the starting point for the chats is based on your current view, so try moving the Earth and pausing and it will reload chats started up based on that position. It's very cool to see how people are linking up all over the world. Try zooming back to see where all the chats go to around the world. It would be neat if the lines changed color based on age and you could see it refresh with more and more data over time. The network link will automatically update every minute with the chatters who started up conversations. The Google Earth network link is probably one of the best "hidden" features of Google Earth. The second network link shows the locations of the top AIM Fight users . I'm not a big AIM user, so I had to look this one up (see Wikipedia article) AIM Fight is apparently an application that calculates who is the most popular chatter based on their links to friends. This network link dynamically shows the result for your current view. Zoom in for more detail. Found out about this via GoogleOperatingSystem blog. Chile Border Crisis - A small town in remote southern Chile is shown to be in Argentina in Google Earth. This is due to an error in the database Google is using. In fact, if you search for "Villa O'Higgins, Chile " GE flies you to the town, and the results come back "Villa O'Higgins, Argentina". And, if you turn on the "Border" layer you can see the border is drawn to show the town in Argentina. However, officials in Chile say the border is wrong and should be fixed. Apparently there were disputes about borders in this area that almost caused war until the Pope settled the dispute. Google has said it is in the process of fixing the error and appreciates feedback on such errors. This story hit the news media over the weekend. This isn't the first time Google has had to fix borders in GE, and I'm sure it won't be the last - borders are always changing. Caribou - Logging giant West Fraser Timber has come under the hi-tech magnifying glass of Google Earth. ForestEthics, an environmental group, has produced a video that "flies" viewers over West Fraser's operations in endangered caribou habitat in BC and Alberta using Google Earth. Gumball Rally - The 2007 Gumball 3000 car rally started yesterday. It's an opportunity for owners of nice cars to show theirs stuff as they travel Europe. The "race" course is mapped, and of course someone has created a way for you to follow the race in Google Earth. You can find the Google Earth maps here (each day gets a different link apparently). With the files comes a course map, placemarks showing the start, finish, and other important way points. The site says it has "live" information, but I'm not sure what the source of the information is yet. There is also a Google Maps version. Emotions - Someone has created an emotion map of parts of San Francisco for Google Earth. This was first done over a year ago in Greenwich, England where people put on a Galvanic Skin Response (GSR) device and used cameras and a PDA to document their feelings and they walked around town. The same thing has apparently been done for San Francisco. 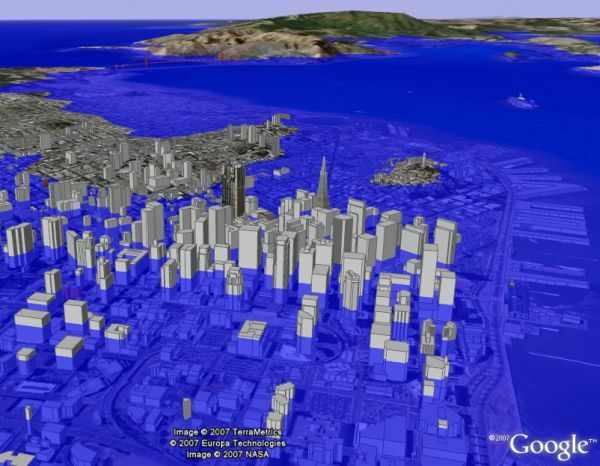 You can see the resulting Google Earth emotion map for San Francisco here. 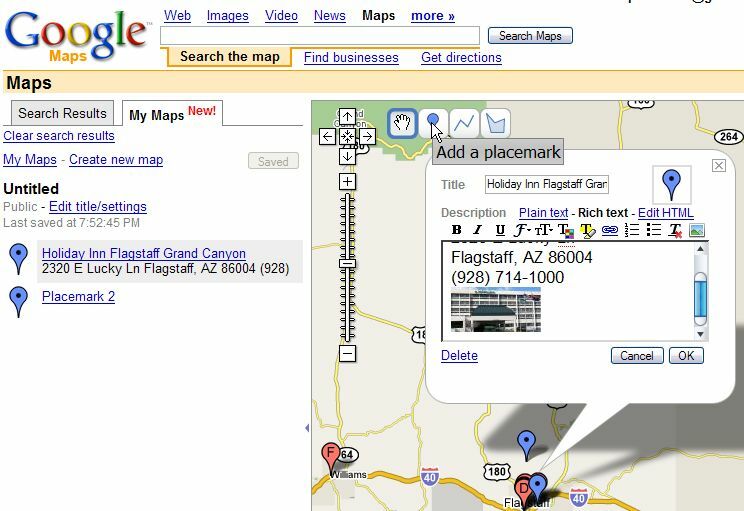 A popular web site for showing off unique things you can find in Google Earth and Maps is GoogleSightseeing.com. Developed by brothers Alex and James Turbull, GoogleSightseeing is a blog which highlights and describes the unique things they find or things suggested by their readers. In the past, they have found pools people have built in interesting shapes like guitars and hearts. A couple of days ago they did one showing pools in the shape of planes. Being an aviator myself, I couldn't resist sharing this one. You can see the four locations they found in this Google Earth file . 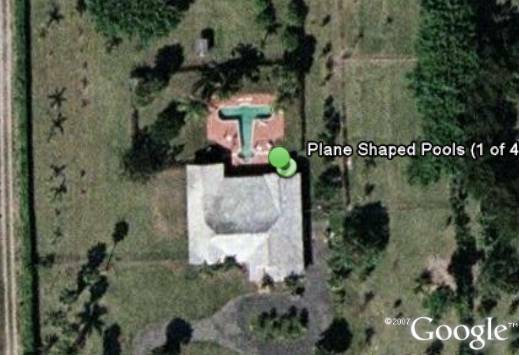 Open the "plane-shaped-pools" folder and double click on each placemark to be flown to each location. Click on the story for more details. The eminent and world-renowned astrophysicist Dr. Stephen Hawking wants to fly in space. Yesterday he got closer than many of us by experiencing zero gravity for several minutes. Dr. Hawking, almost completely paralyzed by Lou Gehrig's disease and communicating largely through eye movements, took a flight on a specially modified aircraft with a padded interior designed to give people who want to experience the zero gravity of space. The company, Zero G, has been offering these commercial flights for a couple of years, and recently received FAA approval to fly disabled people on the flights. Dr. Hawking was accompanied by an entourage of caretakers and medical equipment (for safety purposes). Money was raised for his flight and over $100,000 will go toward a charity he has chosen. 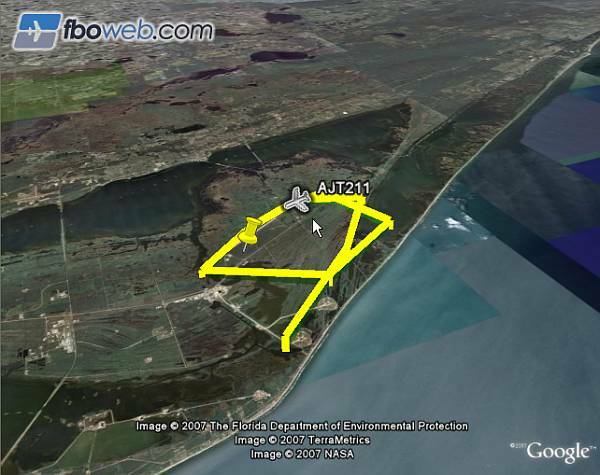 You can see a portion of his flight which flew over NASA Kennedy Space Center and landed at the Shuttle Landing Facility, in Google Earth here (courtesy of FBOweb.com which showed his flight in Google Earth in real-time yesterday). You can read more about Dr. Hawking's flight at the Washington Post or Reuters. The founder and CEO of Zero G, Peter H. Diamandis, has been a friend of mine for many years. He also founded the X Prize which was designed to help encourage private space travel and achieved world-wide recognition when Burt Rutan's Space Ship One won the $10 Million dollar prize in 2004. Larry Page, co-founder of Google, is on the Board of Trustees of the X Prize Foundation. This is a lot of new coverage! Not sure yet whether this means directions are available for all these countries. Russia, for example, has some new major roads, and big cities have down to smaller streets - but, other cities are still missing street-level data. 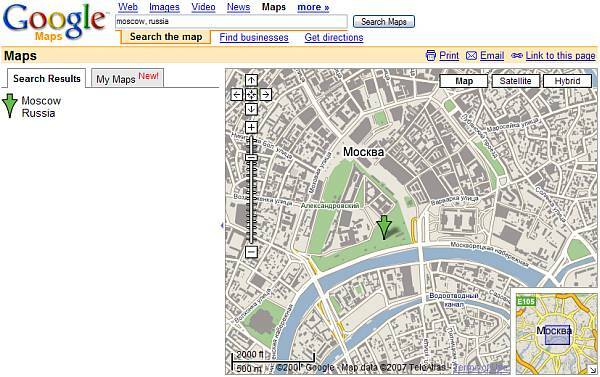 I did notice that Moscow even has building outlines in the city (although not the new 2.5D buildings like in the US). Also, they probably do not have "Local Business" search available. But, Google has been adding more data on a global basis at a prodigious rate. So, why am I blogging about it? Because once they release it to Google Maps, they inevitably begin working on porting the data over to Google Earth as well. So, in a few weeks or months (it took six months for New Zealand and Australia) we can expect GE will have even more road layer data and possibly points of interest layers (dining, lodging, parks, etc.) as well for some or all of these countries! 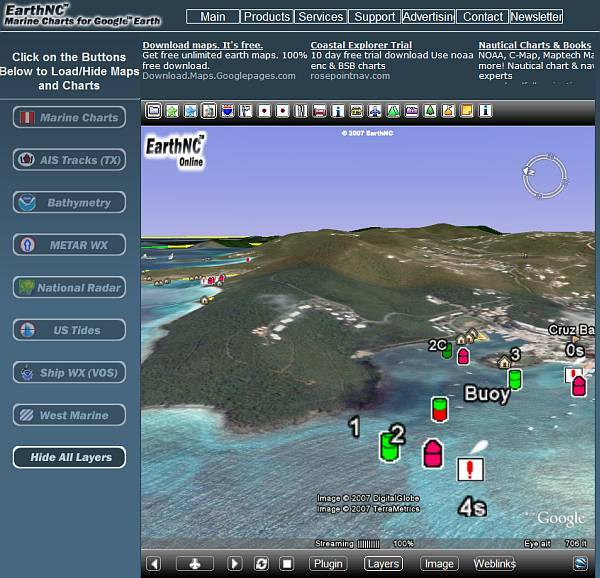 EarthNC (short for "Earth & Sea") recently released marine charts for the entire US and Virgin Islands for Google Earth. These charts come on a CD for a much lower price than typical vector chart data, and they take full advantage of the Google Earth platform for viewing the data. 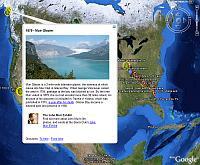 Now EarthNC has announced a new web site which allows you to view the Google Earth content through a web browser. 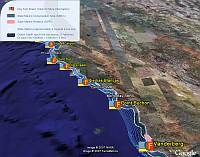 EarthNC is using a very neat plug-in from GoogleEarthAirlines which allows you to view and control Google Earth through a web browser. Go to EarthNC's online page and follow the instructions. Once the plug-in is installed when you view the window you hit a button that starts up Google Earth in the background but shows the output on the browser. Then, using buttons on the screen you can turn on and off layers including the EarthNC Marine Charts, and several other interesting layers developed by EarthNC like weather, vessel tracking, and more. The Google Earth browser functionality works quite well, and EarthNC's different layers are impressive. The Marine Charts are limited in the online version to harbor charts and basic navigational data. You don't see the full spectrum of data available such as depth contours, fish havens, wrecks, soundings, etc. unless you purchase the EarthNC Plus or EarthNC Pro (available soon) versions. I also encourage you to check out GoogleEarthAirlines which first developed the browser plug-in for Google Earth. WikiPedia - placemarks of notable places written about in the Wikipedia which have been georeferenced. So, if you are browsing the world and need more information about interesting places, I highly recommend turning on the Geographic Web layer. The Panoramio photos in particular are particularly useful for letting you get a perspective on what people have seen in the area you are viewing. I'm looking forward to planning my next trip and using this as a way to make sure I see the best things. The American Institute of Architects (AIA) and Google Earth launch two new AIA layers to Google Earth today: Blueprint for America and America’s Favorite Architecture. In marking AIA’s 150th anniversary and Google’s first YouTube announcement (see below), the AIA and Google Earth partnership demonstrates the impact of architecture on our lives to more than 200 million Google Earth users. The Blueprint for America layer documents community service efforts funded by the AIA, where AIA members donating their time and expertise to collaborate with community leaders and local citizens to address issues such as homelessness, sustainable communities, and downtown revitalization. America’s Favorite Architecture layer features the American public’s favorites as selected by a poll announced earlier this year. 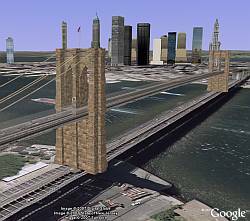 Google Earth viewers can see many just created 3-D models of the ballparks, bridges, buildings and memorials that characterize architecture for Americans as well as comment about the poll results. In a post here at GEB last week, I had noticed there were number of excellent new models posted by Google to the 3D Warehouse during the past few weeks. Now we know why these models were being done! 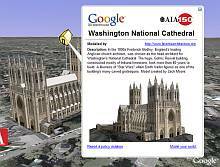 To view the models, turn on the new American Institute of Architects Layer and fly to the placemarks shown (Google Earth 4 required). Zoom down close enough to see the buildings (or double click the placemarks). You will see the buildings automatically load. 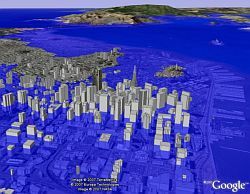 I recommend turning off GE's normal 3D Buildings layer if you experience performance problems in big cities. There are some excellent building models in the collection, and I will highlight some later in a video. La nueva película Spider-Man 3 está pronta a aparecer y ya hay varias promociones relacionadas con la misma. 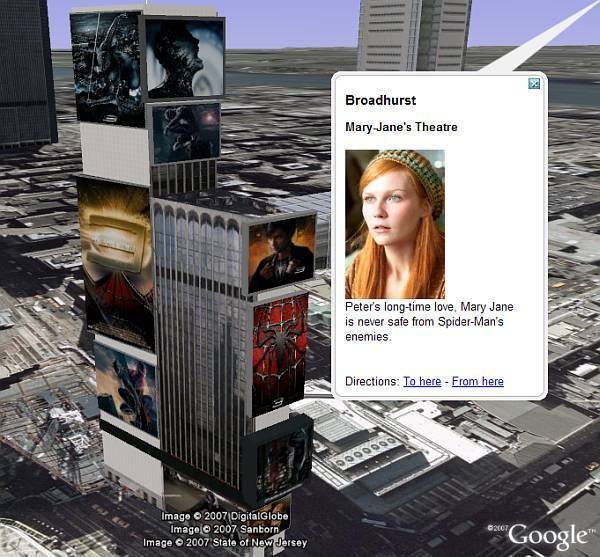 Recién lanzada hoy en Londres (de acuerdo con mis fuentes) está lista la colección de modelos 3D para Google Earth creada para destacar algunos lugares de Manhattan donde Spider-Man estará deslizándose en la película. Pueden descargar esta capa especial de Spider-Man 3 para GE , y luego probar el Tour hacia las diferentes locaciones. O, simplemente, hagan doble clic en cada una de las marcas de posición para visitar los edificios 3D. Encontrarán al mismísimo Spidey en uno de los pilotes del Puente Queensboro, así como también en el borde del cartel de Daily Bugle. Pero deberán acercar bastante la vista para poder verlo. 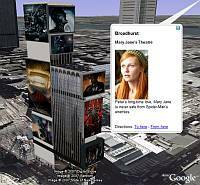 Me dijeron que los modelos 3D de Spider-Man 3 fueron creados utilizando SketchUp por Concept 3D - la misma gente que hizo el nuevo conjunto de edificios 3D de Las Vegas para GE. La colección actualmente se encuentra aquí, pero pronto estará en el sitio oficial de Spider-Man 3. The world famous, at least to surfers, Maverick waves off Half Moon Bay in California have recently received some scientific research results which explain how the waves are formed. The Mavericks are used for big wave surf competitions often reaching 15 meters in height. New Scientist highlighted the story last week where US National Oceanic and Atmospheric Administration researchers revealed they have an explanation for how the Maverick waves are formed. The scientists used advanced underwater imagery techniques to reveal the undersea terrain in the area (more details here). 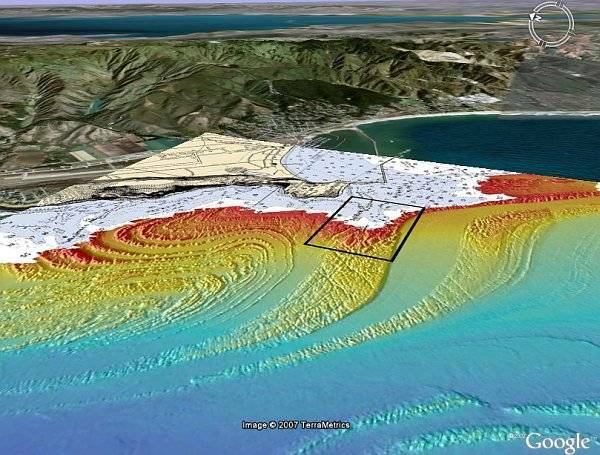 Here is an image overlay for Google Earth of their colorized map showing the undersea terrain. This gives you a bit more perspective of the area rather than just viewing it as a 2D image. You can also view the overlay in Google Maps. French Election Results in Google Earth - France only? This is very interesting. Renaud Euvrard of France sent me an E-mail this morning that Google has released the French presidential Election results (1st round) in Google Earth. He blogs about it and even shows screenshots of the layer. What is interesting is that I don't see this layer in Google Earth. Apparently, Google has released the layer just for those who view it from France. 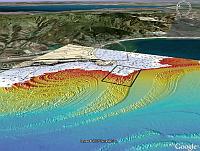 In fact, Renaud pointed out there is a press release at the French Google Earth web site here. Now, it is possible Google just hasn't pushed out the layer to everyone yet - or wants an English translated version before they do. But, I find it interesting to consider the possibility of local information being made available in Google Earth only for local viewers. Tour de France - This year's Tour de France will be held from July 7 to July 29. For each of the last three years (since Google Earth was released in June of 2005), bicycling fans have created detailed maps showing the routes of the various stages of the Tour de France as they bike through the country-side and mountains of France. Google Earth allows you to fly-over same route the bicyclists take and see the grueling 3D terrain they have to endure. This year will be even better because the mountains of France now have much better resolution imagery. Christoph of Germany has already begun posting some of the stages for this year's TdF, as well as some of the prologue racing in the UK. Here is an example of stage 8 of this year's event. 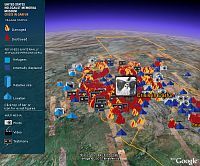 Tasmania Logging - Noel Jenkins mentions the Google Earth content produced by The Wilderness Society about the impact of logging in Tasmania. The story got mentioned in Telegraph magazine and Noel describes the Google Earth content in his JuicyGeography blog. GE-Sharing - Last week I was contacted by the developers of a new tool letting you share the same view of Google Earth called GE-Sharing. Similar in concept to Unype, this one doesn't require you to use Skype or install an application to use. Everything is done with network links and E-mail. Stefan Geens at OgleEarth has written a nice review of GE-Sharing which I recommend reading. I may not have a chance to review it myself for a few days. More Biking - Just got an E-mail from Stefan Lorimer who tells me a friend of his named Kyle Skidmore is biking with another guy across Canada and they are blogging their trip. More importantly, Kyle is a GE enthusiast and has created a GE map showing their route. I would be more impressed if they would show their track and location with each blog entry. But, maybe they'll do a special GE file after they get back and include some photos. There were reports a week ago after the Crisis in Darfur layer was released that some people were not able to download Google Earth in Sudan. Stefan Geens of OgleEarth asked Google about it and was told by Google that they had to disallow downloading of Google Earth in Sudan because of US Export laws due to sanctions against Sudan. It is rather ironic, as Stefan points out, since those who are responsible for the atrocities in Darfur are the only ones who benefit from not being able to see the new layers which expose the atrocities to those viewing them in Google Earth! Maybe Google could ask the government to make an exception in the case of Google Earth. En celebración del cumpleaños de John Muir (21 de Abril, 1868), el Sierra Club - que fuera fundado por Muir en 1892 - ha hecho un archivo para Google Earth que permite ver algunos lugares claves de su vida. John Muir fué un legendario naturalista, explorador, escritor e inventor. Si hubiera nacido un siglo después estoy seguro de que hubiera sido un fanático de Google Earth. Pueden leer acerca del archivo en el Sierra Club. Incluy no sólo marcas de posición de los lugares claves de su vida, sino también parte del viaje que hizo cuando era joven y que llamó la "Caminata de Mil millas hacia el Golfo". Ojalá que el Sierra Club incluya este viaje completo algún día. Global Cloud Map - this network link lets you automatically view a composite of satellite photos of the Earth's clouds overlayed on the Earth. Not only that, but it automatically shows you the latest composite from a server which updates every 3 hours. If you store this network link in your My Places, every time you turn it on it will automatically have the latest photo (you must have an Internet connection obviously). USGS Earthquake Monitoring - This network link automatically shows you the most current seismic activity - and summarizes activity during the last week with greater than magnitude 1.0. Read more about it here. Notice that the network link includes placemarks, lines, and a legend. Anything you can put in a KML file can be in a network link. This network link automatically updates (or refreshes) every 5 minutes. 3DWarehouse Network Link - This network link both presents to you the latest locations of 3D models at the Google 3DWarehouse, and also uses the feature of view based refresh. Depending on where you look, it will present you more information at that location. If you are zoomed further out it will show you a summary of models in different areas of your view. Zoom in closer and it will show you individual placemarks for each model in your view (if there are any). Read more about the 3DWarehouse network link here. Besides providing the powerful ability to provide you with current and dynamic information, the network link can help you manage your Google Earth data much more efficiently. If you save a lot of your favorite KML files in your My Places it can slow down how fast Google Earth starts. This is because all the files in your My Places have to be loaded when you start. You can still keep pointers to all your favorite files, but keep the file size much smaller by using the network link. First, save each of your favorite KML content from your My Places to a file on your local machine, or, better yet, find the URL of the original file on the Internet. Then create a network link (menu "Add->Network link..."), and either put the local file location or the URL of the KML file in the Link field. Give the network link an appropriate name and description. 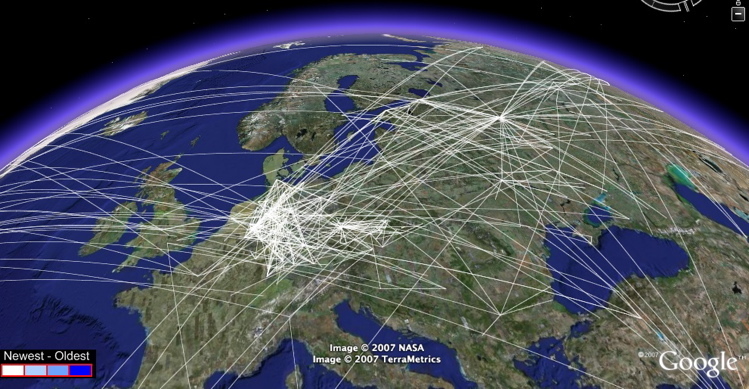 Before you exit Google Earth, decide whether you want the network link turned on or not. Your My Places will now only be a couple hundred bytes for each network link and will only load more information if you leave it turned on the next time you start Google Earth. You can also have network links load other network links to reduce the size of your My Places even more. But, I'll save tips on doing that for a future post. I also saw an interesting new venture that you've arranged with Google Earth. As a result of this partnership, millions of Internet users around the world will be able to zoom in and see satellite images of the burnt-out villages and mosques and schools. No one who sees these pictures can doubt that genocide is the only word for what is happening in Darfur -- and that we have a moral obligation to stop it. It's not every day a Google application, and specifically a layer in Google Earth, gets mentioned by the President. So, I thought this was worthy of a post! The layer is certainly worthy of praise, and we can only hope other heads of state take note - and take action - about the Darfur crisis. By the way, Declan Butler of Nature Magazine has published an article which tells the story behind the Crisis in Darfur layer. GeoBeats is an interactive media company whose mission is to inform travelers about international destinations through the use of video. The site is currently in beta, but already has a nice sized collection of well-done videos with local people describing their favorite location. They have created a Google Earth collection of placemarks showing the locations of their videos (also viewable with Google Maps) with a link back to the video you can watch. GeoBeats has a hip Web 2.0 social networking feel which encourages comments and suggestions for new content. The travel video approach is very similar to the Turn Here travel videos which have their own sub-layer under the Travel and Tourism layer in Google Earth. However, the two sites are pretty complementary since Turn Here is mostly in the US and GeoBeats videos are currently mostly in Europe. Both of these sites will really benefit in Google Earth when Google (not "if" - are you listening Google?) implements the ability to show embedded video content in placemark descriptions. If you use Google's 3D Warehouse you can see the most popular, and most recent models being added. Many of the new models added are for viewing in Google Earth. In fact, Google apparently has a team of 3D modelers continuously working on new models. Check this link for a reverse chronological list uploaded under the "Google" modeler account. They seem to be concentrating on major landmarks around the world, but there are also a few collections that are getting some focus like the Denver, Colorado collection I've already pointed out. Also, there seems to be a number of nice new models for Washington, DC and New York City recently. About once a month, Google appears to be adding more of the models into the built-in 3D Buildings->Best of 3D Warehouse layer. But, you can download each of the uploaded models currently in the 3D Warehouse by downloading the 3D Warehouse network link . There are hundreds of models being added each month by Google and other contributors around the world. You can try your hand at as well by downloading the free Google SketchUp. If your model is built well, with particular attention to both looks and performance, Google may select your model for the Best of 3D Warehouse! Brooklyn Bridge (3.4 MBytes) - this is a well done model which even has satellite photo textures for the cars going over the bridge, the suspension cables, and even the flags on top. It blends nicely with the terrain as well. This one is my favorite of the new models. The only improvement I could see would be to offer an image overlay to photoshop out the satellite view of the bridge which you see below the bridge now. Biltmore Estate - This is probably the best known building landmark in North Carolina. 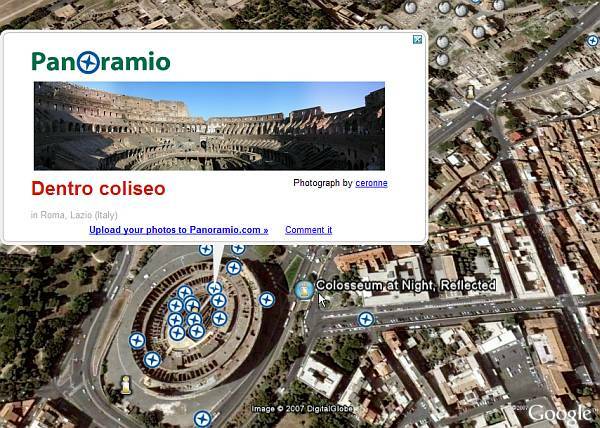 Check ou the Panoramio photos by turning on the Geographic Web layer. Note how the modeler added some custom terrain to make the model sit properly. Washington National Cathedral (1.1 MBytes) - Excellent detail on this beautiful church. Check out the other 3D buildings in the "Best of 3DWarehouse" layer for the Washington DC area. I really like the Capitol Building model. 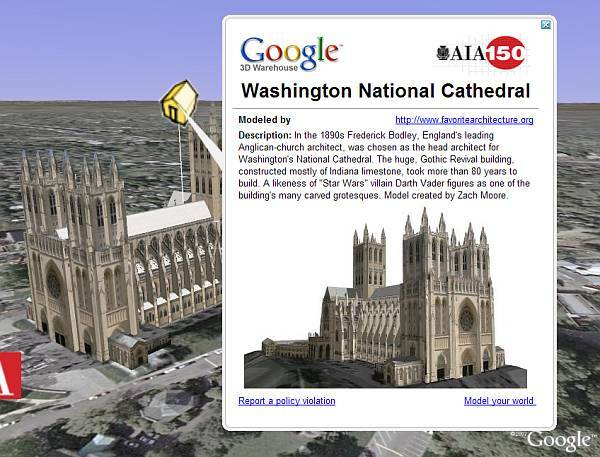 Note the National Cathedral also has a terrain modification so the model fits properly. This is a good tip for those of you who are modelers. Leszek at FreeGeographyTools.com blog recently reviewed the handy GE-Graph tool by R. Sgrillo of Brazil. This very useful tool has been updated since GEB first reviewed it in May of last year. 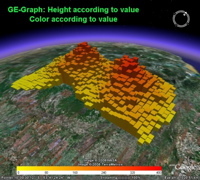 GE-Graph can be used to generate 3D graphs using Google Earth both to create the location data and provide the powerful graph visualizations. It supports both colorful bar charts, and also 3D shape file charts as well. He even provides links to shape files for states for various countries. In addition to GE-Graph, Sgrillo has provided an application called GE-Path which (as the name implies) lets you draw paths by connecting placemarks. This program also lets you draw polygons and import data from spreadsheets. A particularly useful feature lets you also measure the distance of paths, or circumference of shapes as well as the area of shapes. Many people have asked how to measure an area with Google Earth, this tool enables that capability quite nicely. GE-Path was especially useful before Google released GE 4 with built-in path and polygon capability. But, the ability to measure area and other features of this program still make it a worthwhile utility. And, since these programs are free, the price is right. 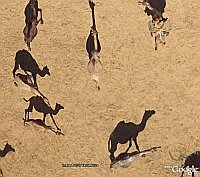 J. Michael Fay, is the National Geographic Magazine photographer who took over 90,000 aerial photos of Africa. A sample of 500 of the photos are shown in the Google Earth Megaflyover layer (see the "Featured Content->National Geographic->Megaflyover" layer). It has just been announced that Michael Fay will be receiving the honorary 2007 Lindbergh Award. The honorary Lindbergh Award is presented to individuals who have made significant contributions over many years toward improving our quality of life by balancing technological advancements and the preservation of our environment. The Lindbergh Award is given by the Lindbergh Foundation which is a legacy of Charles Lindbergh, the famous aviator who was the first to cross the Atlantic using his custom Spirit of St. Louis aircraft. The grandson of Charles, Eric Lindbergh, will be present during the award ceremony. Congratulations to Michael Fay, a well-earned honor! Related: See some of the Megaflyover photos in Google Earth showing African animals. The world is truly a really big place. At any moment in time you can take a picture from space (or an airplane) and always catch something interesting going on. With millions of people using Google Earth and Maps, eventually someone will happen upon something interesting among the millions of photos in the Google imagery database. Here we have not one, but two different submarines at sea - not under water, but moving along at a high rate of speed (from the looks of their wakes) at the surface. No, these are not live photos. In fact, the sub coming out of Tokyo Bay (Maps view) in Japan was first found back in August of 2005 - the image is older than that. 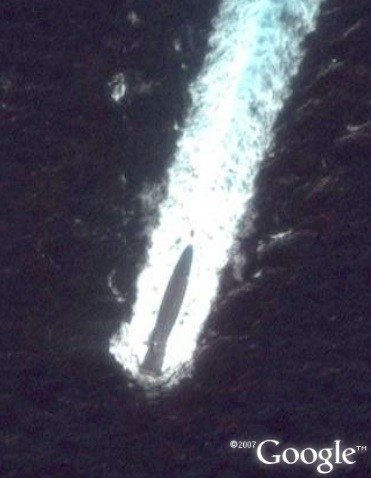 The second sub (Maps view) is a Ming-class sub from China headed back to base. Very surprising when you consider Google doesn't show much of the seas on our planet with high res satellite photos. 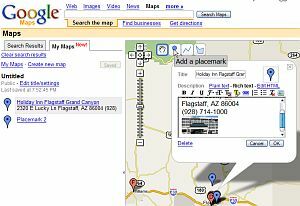 There are some great web sites for finding interesting places in the maps programs. For example, the Chinese sub I found on Google Earth Hacks (www.gearthhacks.com) which has been dedicated to allowing people to find Google Earth places, and KML files since Google Earth was first released. Google Earth Hacks also provides links for Google Maps for single placemarks. 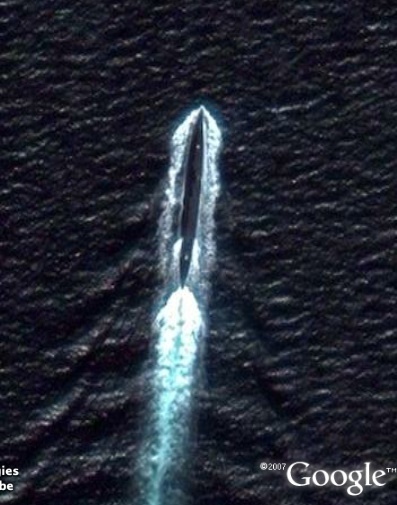 The sub from Japan was found at Virtual Globe Trotting (www.virtualglobetrotting.com) which not only shows Google Earth and Maps, but also Microsoft Live Local (or Virtual Earth), and Yahoo Maps locations. Each of these sites are a great way to get a gallery of screenshots showing interesting places you can find from satellite and aerial photos. I also often highlight cool things written about at the GoogleSightseeing (www.googlesightseeing.com) blog - this blog does a great job of writing about interesting discoveries in the Google imagery every day. I recommend checking them out whenever you're looking to browse the world for interesting sights. My Maps/YouTube - DigitalUrban has a demonstration of the new feature in MyMaps that lets you input YouTube (or GoogleVideo) videos in your placemark descriptions. I would like to see this capability added to Google Earth - although, as I've said, I really want the ability to put videos into GE 3D models - like you can in SecondLife. See the example here. Nokia N95 - This new phone from Nokia has received a lot of attention in the gadget world. It has a nice combination of good quality built-in camera, phone features, MP3 capability, and - most importantly - a decent GPS. The GPS capability supports outputting tracks and waypoints to Google Earth. Andy at DigitalUrban has just bought one and posts about using it track a trip on a train (which you can see here in Google Earth ). Census - If you are interested in more visualizations of the full census data available from the US like what we saw at gCensus, then there's another blog to look at: Census KML Data Visualization. The blog's author, Aidan Marcuss contacted me to let me know he has just released some interesting visualizations of Federal Election Commission data. He also is using county shape files and using them to indicate data with height and colors. In addition, he has started experimenting with comparing data using the time features in Google Earth. If you load the 109th and 110th Congress for New York you can use the time slider to compare between the two. You can also view some of these (when they aren't too large) in Google Maps - see New York's 109th Congress for example (without the 3D obviously). Arc2Earth Publisher - Arc2Earth Publisher is now available for purchase (Regularly $999 - $699 thru May 15). This price may seem daunting, but this is the higher-end version of software enabling users of ESRI ArcGIS software to output sophisticated visualizations using public tools like Google Maps, Google Earth, Virtual Earth, etc. So, if you are a GIS professional, you should definitely check this out. Here is an example of outputting shaded relief data for the US in Google Maps. Show-n-Tell - During the Association of American Geographers annual meeting next week in San Francisco, Alan Glennon has announced there will be a "Spatial Technology Gallery" showing off virtual globe and related technology - on April 18th. More details in his post. Detailed Roads Layers for India and Singapore - Now you get major roads and streets with labels for the entire country for these two locations. These were already deployed in Google Maps, but are now available in Earth. The screenshot above is from Singapore. Points of Interest for India, Singapore, and Brazil - Now you can turn on points of interest layers like Dining, Lodging, Parks and Recreation, and Shopping and get placemark icons for these types of businesses as you zoom in to major metropolitan areas. Best of 3DWarehouse - This sub-layer to the 3D Buildings layer was updated adding hundreds of new buildings. There are well-known buildings added in cities all over the world, and lots of buildings added to Denver, New York, and other places. Please leave a comment if you find some unique buildings added worth highlighting. Google made an announcement about the rest of the changes on Tuesday. But, I was doing some travel and caught a cold so I didn't pay close enough attention. Sorry for not reporting this earlier! Here's my updated summary of all the layer changes from Monday. By the way, I believe these buildings are directly coming from those old "gray 3D buildings" Google has had in Google Earth since it was released back in June 2005. Now that I think about it, I'm kind of surprised Google didn't implement this 2.5D version of the buildings in Google Maps sooner. Of course, it probably took a while to create the 2D projections, optimize the imagery, and generate the database for all zoom levels possible for Google Maps. And its not like Google hasn't been doing lots of other interesting things to the Geo products! The Google Geo Developer Day, held last year just before the Where 2.0 conference, has grown into something new. Now, the day after this year's Where 2.0, on May 31, Google is holding the Google Developer Day which is simultaneously being held at 10 different locations world-wide. That's right, no "Geo" in the name this year - they are also going to invite developers of other Google application APIs. In Mountain View, the event will still be dominated by Geo-related issues (since so many geo developers will be at Where). To find out more about the events, here is the Google Developer Day web page. Read the details and follow the link provided to register. If you're going to be in Mountain View, you'll want to register quickly. The event was overflowing last year since it also included a chance to visit the Googleplex and get free food. They haven't said yet what the amenities will be at this year's event, but its likely to be good. And, if you're going - and are a regular Google Earth Blog reader, look me up. I'll be there and at the Where 2.0 conference as well. But, if you can't go - note this: "The Mountain View event will be carried live via webcast, with the other events shown via a dedicated channel on Google's YouTube video site." Last year's event was the launch of a major new version of Google Earth (GE 4) and the biggest release of new imagery ever for Google Earth. So, I'm looking forward to what is in store for this year's event. However, given the event has been expanded beyond the Geo products, I'm thinking it may not be as major for Geo this year. Buried in the new layers added to Google Earth on Monday, was a new sub-layer found under the Travel and Tourism layer. The new layer is the first example of a country getting a built-in GE layer celebrating the travel and tourist spots in Google Earth. 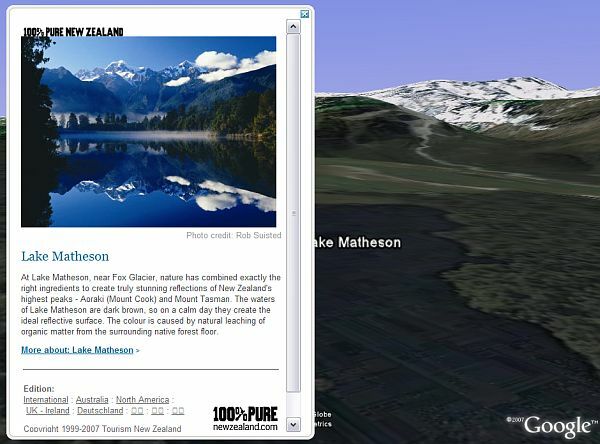 The "100% Pure New Zealand" layer contains placemarks highlighting destinations, scenic highlights, and the location of visitor centers around the country. The placemarks contain beautiful photos, descriptions, and links back to the relevant main New Zealand travel web pages. Since I've been planning to visit New Zealand for some time, this is a great additional tool for planning. One thing that is apparent when you compare the scenic photographs to the Google Earth views is that GE's New Zealand terrain would really benefit from higher resolution. The photos in this new layer demonstrate that higher resolution terrain would make looking at New Zealand in Google Earth even more exciting. If I had a vote, New Zealand would be the next country to get high resolution terrain like Switzerland did in late February. So, I'm wondering which other travel and tourism departments are going to rush to ask Google to be included? I'm sure New Zealand tourism will benefit from the additional traffic they will get as a result of this new layer. Google has quietly (I'm waiting for an announcement) just released some new layers for Google Earth. They also have re-arranged the order of some of the layers so they make more sense. The "Global Awareness" layer is now separated from the "Featured Content" layer. 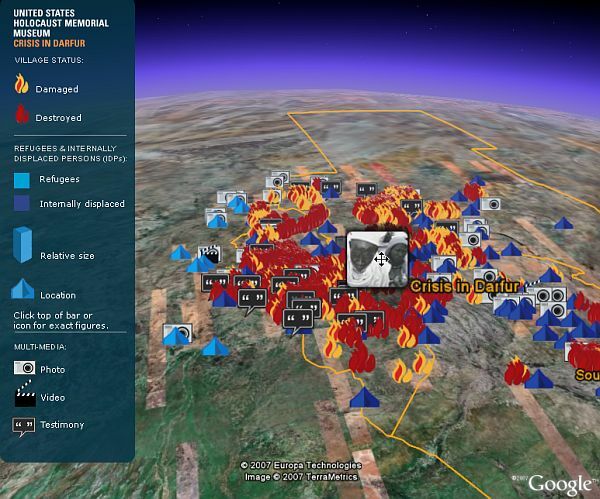 Crisis in Darfur - This new layer is turned on by default now when you open Google Earth. You will find it under the Global Awareness layer folder, the first layer is now "UHSMM - Crisis in Darfur". 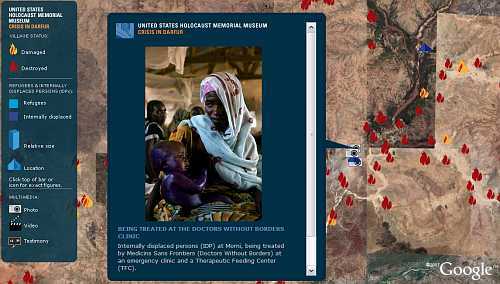 The US Holocaust Memorial Museum (USHMM) has substantially updated content which was described here a couple of months ago about the human rights abuses occurring in Darfur. The USHMM declared a genocide emergency in Darfur in 2004, and already 2.5 million people have been displaced, and 300,000 people killed in the region. This layer does an amazing job at illustrating the crisis in the area showing satellite photos of destroyed villages, locations of refugee camps, photos of human rights abuses, and provides links to more information on the web. A press announcement is being made tomorrow on this new layer according to CNET. Layers Moved - Two layers were moved out of Featured Content into the Global Awareness layer: UNEP: Atlas of Our Changing Environment, and the Jane Goodall Gombe Chimpanzee Blog. 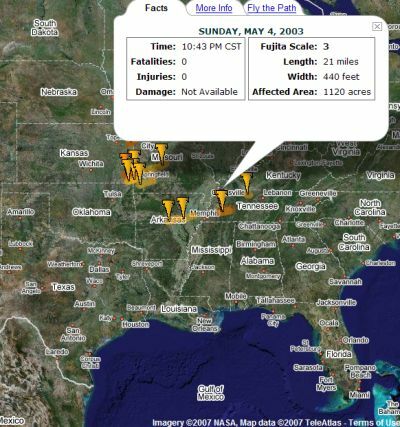 Trimble Outdoors Trips - This new Featured Content layer comes from Trimble - makers of GPS technology. It's focus is to provide information on outdoor hikes, GPS tracks, photos, videos, and other related information. From what I see so far, the content is all in the US. But, they have a special web site designed to allow people to upload their information on trips, so I'm sure other locations can be handled as well. There are a lot of similarities in the content to the Tracks4Africa layer which is also in the Featured Layers. 100% Pure New Zealand - New Zealand is the first country to get its own tourism layer under the Travel and Tourism layer. 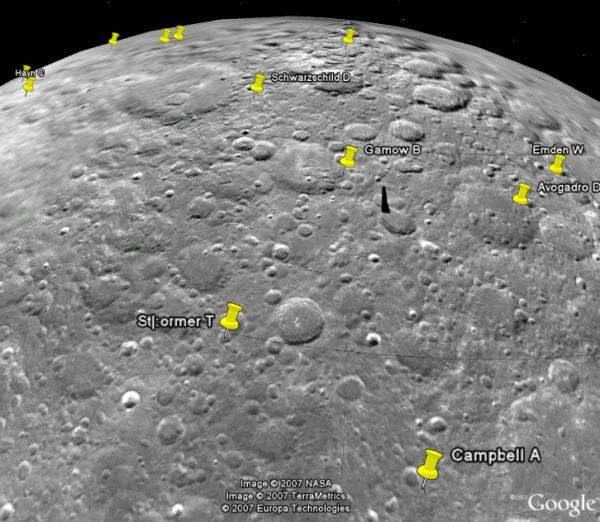 In celebration of the grand opening, Matt has released at least two new Google Earth files: One that provided a new Moon overlay for Google Earth using high-resolution satellite photos from the NASA Clementine mission. And another which provides overlays for GE for showing Mars imagery from the Mars Digital Image Mosaic at 64 pixels per degree produced at the U.S. Geological Survey in Flagstaff, Arizona. Both of these were created using the region layer capability in GE 4 to allow high resolution tiles to be viewed as you zoom in closer. As Matt recommends in the instructions after you download the files, you should turn off most (or all) of your layers (so you don't see Earth-based information while viewing these planets). And, I recommend turning off the View->Atmosphere as well. About.com has published an article entitled "Google Earth and Archaeology" by K. Kris Hirst. The article is a good description of the fascination many people have when they realize they can virtually travel the world and see both famous, and rarely visited archaeological sites. Not only that, but the article also highlights the phenomenon of armchair archaeologists who are actually using Google Earth to further research and make discoveries using the valuable resource of imagery Google has made available to us all. The article highlights the efforts of JQ Jacobs who is producing a gallery of archaeological sties with placemarks highlighting many objects at each site. See this collection of placemarks of the Caral and Supe Valley ruins in Peru . It also highlights Scott Madry who has received a great deal of attention for his discoveries in France using Google Earth. 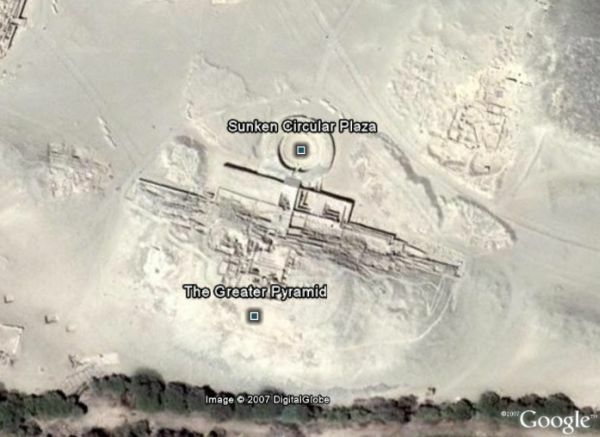 The article goes on to reveal the Google Earth puzzle games at the Google Earth Community which are focused on archeology. Someone posts a screenshot of an archaeological site (with no coordinates), and you have to respond with your own screenshot proving you found the location in GE. Google Earth Blog has been increasing the use of video in blog entries to illustrate unique content best seen in motion. In fact, I've just added a new category today called "Video" for blog entries including video, and you can view a gallery of YouTube videos created by Gearthblog here. Google SketchUp es el más intuitivo programa de modelaje 3D que jamás utilicé. Y es la mejor manera de crear modelos 3D para Google Earth - sobre todo porque es una herramienta gratuita. Pero, como en toda aplicación poderosa, hay muchos trucos que pueden acelerar el proceso de creación. Y hay varias características muy sofisticadas detrás de su intuitiva interfaz. Un par de meses atrás, escribí sobre los chicos de go-2-school.com que hicieron unos videos de bastante calidad con tutoriales mostrando las mejores características de SketchUp. Continuaron regularmente mostrando más cosas interesantes, y si estás metido en SketchUp, te recomiendo chequearlos con regularidad. Aquí hay un ejemplo de video mostrando cómo crear una esfera (Quicktime video) con SketchUp. Además, la Escuela ha producido un DVD con sus tutoriales llamado "SketchUp Level One" (SketchUp Nivel Uno). Me enviaron una copia, y tengo que decir que me impresionó bastante. Me gusta el formato, la calidad del video, y la manera en que explican las cosas de forma no-técnica (sin aburrirte si eres muy técnico). Hay 26 capítulos de contenido en este DVD, asi que es bastante material para convertirte, de principiante, a un modelador 3D competitivo con SketchUp. Clic aquí para ver una descripción completa del DVD. El DVD está disponiblee por sólo $79 dólares. Una ganga por la calidad de entrenamiento que ofrece. También verán que están trabajando en el DVD Nivel 2. Google has just released a significant update to Google Maps which allows anyone to, in a sense, create their own maps "mashups" - or what they call "My Maps". Google was kind enough to demo the new features to me on Wednesday. Look at Google Maps for a new tab on the left which lets you view and create "My Maps". 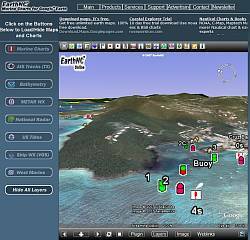 The user interface for creating content is point and click and uses many of the same approaches and functionality as seen in Google Earth. For example, you can create placemarks, paths, or shapes. For descriptions, you can even use a familiar rich text formatting mode to dress up your descriptions, or use HTML if you prefer. The end result of this new update is that Google Maps and Google Earth are coming closer together in many respects. The really interesting aspect to the announcement is that the underlying data is all KML! KML is the file format for Google Earth content - and now Maps too. This means you can create your maps and then click on the "KML" in the upper right of the map and immediately view the content in Google Earth. Furthermore, when you search for content you will not only be able to get local business search results, but also get KML search results (just like the recent KML search update for Google Earth). Look for a "See user-created content" link after the other results - it only appears when there is relevant content searched in the current view (see example). When you first load Google Maps and go to the "My Maps" tab, you will be presented with some example public maps called "Featured content" (sound familiar GE users?). These examples were actually the result of a contest held internally at Google. The prize for the contest was a Nintendo WII, and apparently the results of the competition was much bigger than expected. Here's a direct link to the first featured map (documenting a trip along Route 66). And, here's a link to the same thing in Google Earth (you could get to this by clicking the KML link in Google Maps while viewing the previous link). 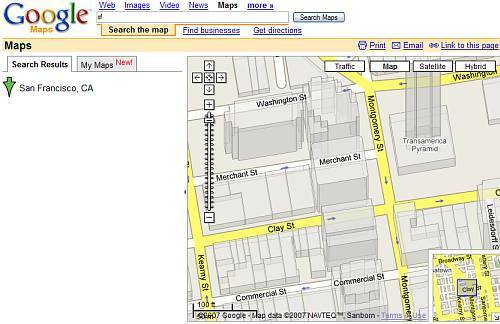 To create your own map, just click on the link under the "My Maps" tab which says "Create new map". You will see four little icons just to the right of the zoom/pan controls on the upper left of the map (see the screenshot above). 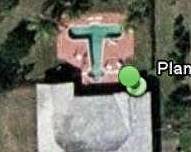 These icons should look somewhat familiar to regular Google Earth users. They allow you to "Add a placemark", "Draw a line", or "Draw a shape". This is all point and click, and works pretty intuitively. When you create a placemark and mark it on the map, you get a little bubble which lets you add a title, and a description. Again, very similar to GE. Just above the description, you can click on "Rich text" to get an interface to add "bold", "italics", etc. GE doesn't have that capability - yet. Once you are done, you can save your map. You also have the option to choose whether your map is "Public" or "Unlisted". If you choose "Unlisted' it won't be searchable. If you choose "Public" your map won't be searchable for a few weeks until Google next updates its search indices (just like with the Google Earth Community layer). This is a nice new capability which will result in even more user-contributed content . It is also very clean and easy to use, and is available with Google-style interfaces. I especially like the "KML" link appearing on Maps which lets you view the content in Google Earth. Using KML underneath is a fantastic move. It means all content is easily available not only to Google Maps, and Google Earth - but also to any other mapping or virtual globe application which supports KML. You can also load KML files into Google Maps (just put the URL to a KML file into the Maps search). Hopefully, the new KML searching capability will evolve over time to make it easier for people to determine whether there is already similar content available for the same location. Currently, the best way would be to use Google Earth and turn on the "Google Earth Community" layer. My current concern is that people will begin using the new My Maps feature and start re-inventing content which is already available (how many more public placemarks do we need to the Eiffel Tower?). This has already been a problem with the GEC layer. The new My Maps feature is great for those who don't have the technical skills to create their own mashup. But, there were already many mashup web sites which have provided similar capabilities (for creating your own maps) using custom coding and the API interface. I suspect some of these mashup makers are going to be disappointed that their efforts will soon be overshadowed by Google incorporating this capability built-in. But, I'm afraid that is just the result of progress in this case. Those who have even more functionality (e.g. Tagzania which allows you to tag placemarks and has handy URL shortcuts and embedding capabilities) will still have a role. Other competing mapping applications (e.g. Windows Live Local/VE) may have similar functionality for enabling people to save/create geospatial content (Microsoft calls them "collections"). But, the underlying KML format combined with Google's ability to search KML is going to form a very powerful combination. Some of the capabilities in My Maps (like rich text formatting) are not even available in Google Earth. I'm sure Google plans to upgrade GE to have these features so capabilities are more uniform. I particularly want the ability to embed videos in GE placemark descriptions. Of course, I also want video in 3D models, but that may have to wait for a future major upgrade to GE. I'm going to have a list of suggestions of things for Google to consider for future versions of these interfaces. There are so many possibilities suggested by the fact Google is now bringing Google Maps and Google Earth closer together. We live in interesting times for the continued rapid advancement of geospatial content - aka maps. Thanks Google! King Tut - Last year, shortly after the first beta test of GE 4 came out, a GEC member called 'atf' released a 3D model of King Tut's burial chamber with some textures. 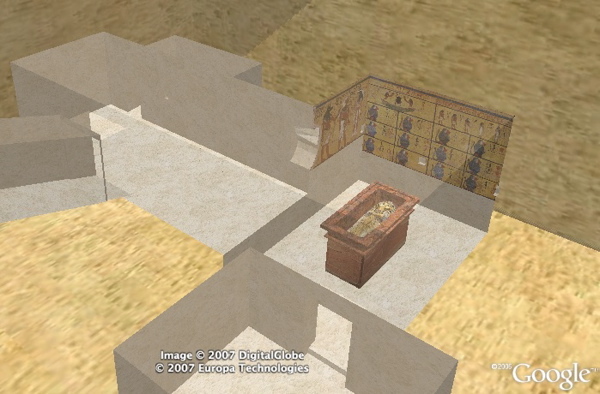 He has recently updated the 3D model with better textures and use of transparency so you can see the layout of the underground burial chambers of King Tut. After loading the file, make sure you open the folders in the "Places" pane so you can see the various views he has set up. Double click on each view until you get to the burial chamber. Grand Canyon Skywalk - GEC member 'pmaxfield2' has posted a 3D model of the recently opened Grand Canyon Skywalk (see pictures). Since the default imagery of the building area actually drapes down the side of the cliff (due to lack of accuracy in the terrain, or photo placement), I posted an image overlay to kind of 'photoshop' out the error (which he has added to the file). Those of you who are better at this are welcome to submit a better overlay at the post thread. Thanks to pmaxfield2 for posting this. Google Solar Panels - Last fall, Google announced they would be installing a 1.6 Megawatt solar panel installation at their headquarters in California. The panels will not only cover most of the buildings at the Googleplex, but will also drape several parking lot shelters constructed for the purpose of creating more solar panel space. For a brief while, the 3D version of the Googleplex actually showed the panels on the buildings in Google Earth - but, I guess Google removed them until the installation is completed. There is a version of some of the buildings (buildings 45 and 47) available, with the solar panels, which you can download for Google Earth 4 at the 3DWarehouse here. 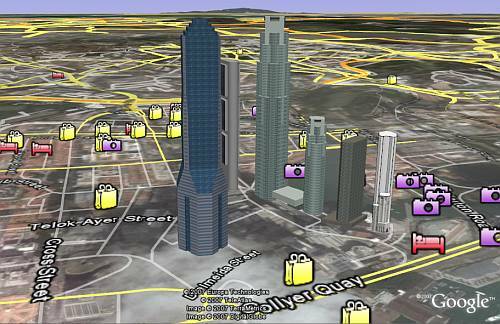 Turn on the "3D Buildings Layer" to see the rest of the modeled 3D buildings at the Googleplex. You'll need to fly to the Googleplex to see the buildings. I'm sure Google will update the default 3D model for the Googleplex when they are ready to announce the completion of the solar panel installation. In the Google Earth imagery update of late February, Google Earth included the entire state of Utah in high resolution. Anyone who has seen pictures or visited Utah knows they have some very interesting geological formations. 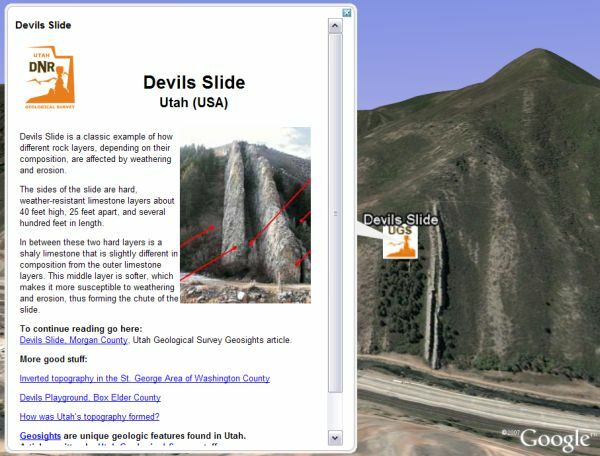 In mid-March the Utah Geological Survey announced the availability of "Utah Geosights " for Google Earth. While this is a just a collection of placemarks, the placemarks are full of interesting information related to each location. Simply click on the placemark to open the descriptions. There are links to other information sources for each placemark. I think this is a good way to get introduced to some of the new high resolution imagery in Utah and to seeing some of the more interesting geological features of the state. Last year, Google did a fun little April Fools Joke for Google Earth. 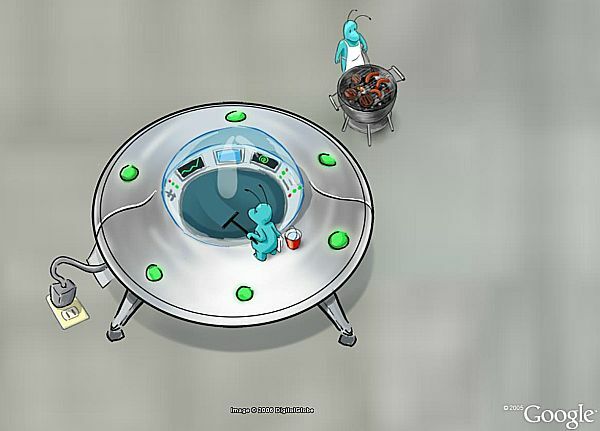 They placed some aliens cooking a BBQ dinner at the airport for Area 51. There was a special layer which popped up to draw your attention to Area 51. I was really looking forward to what they would do for this year, but apparently Google dropped the ball this year, and we didn't get an April Fools for GE. The folks at GoogleSightseeing.com did do a pretty amusing April Fools blog entry. They excitedly reported on the availability of "Live Satellite Images in Google Earth!". According to their sources, Google started only with Edinburgh in the UK (which happens to be the home town to the guys who write GoogleSightseeing). They even provided a Google Earth file to the "live" content , but for some reason it always seems to show clouds over Edinburgh. Thanks to GoogleSightseeing for at least some April foolery! If I had known Google was going to fall down, I would have cooked up something extra special myelf. Oh well, there's always next year. Someone from the Department of Atmospheric, Oceanic and Space Sciences at the University of Michigan posted a Google Maps mashup which shows the paths of tornadoes from 1950-2004 (they have plans to do more). If you click on the tornado icon for one of the paths, you can click on the tab which says "Fly the Path" which lets you download the path for that tornado into Google Earth. This way you can get a close view in 3D of the path of the tornado. It would be nice if they also let you download an entire month's worth of tornado paths into GE. I'd like to see someone use this same technique for hurricane paths. The same interface could be used with just a different data set. 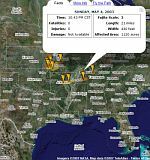 Bible Geocoding - The Openbible.info web site has added a Google Earth collection of placemarks with the goal of marking every identifiable place mentioned in the Bible. They also offer the same information organized by chapter from both the New and Old testaments of the bible. Avian Flu Update - Declan Butler, Senior editor of Nature Magazine, has updated his Avian Flu Google Earth network link which shows the locations of all reported cases of Avian Flu (both human and avian) all around the world. The network link can be viewed with the time slider so you can watch the progression of the spread of the flu over time. The interesting thing is that this winter season has witnessed a remarkable drop in the number of reported cases. I'm wondering whether this is due to the steps taken to stop the spread of the flu, or if it is dying out on its own. Declan hasn't yet updated his blog to comment on the results. Here's a link to official information on the state of the flu. Highway Crashes - The Technology Review has published an article today which discusses work done by researchers at the Ohio State University for modeling the probability of traffic accidents occurring at certain times and places in the state. The interesting part: "What makes this model novel is that scientists have now combined the statistical software with Google Earth...". SF Chronicle - The San Francisco Chronicle has published a story titled "A whole new way to look at the world". The story is a good summary of some of the more notable things being done with Google Earth, and some of the sticky issues which have been raised about the program. There is the usual touch of sensationalism by remarking on the "Orwellian" prospects Google Earth presents to watch what we are doing, but well balanced with the positive and practical uses people have been making with it. 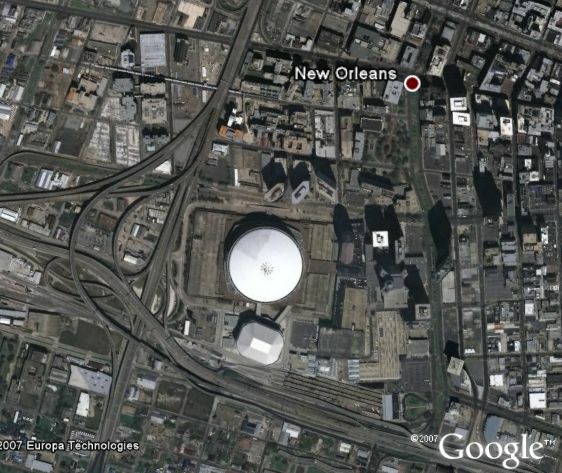 In response to the media-hyped outcry of last Friday, Google has updated the imagery for the New Orleans area with recent imagery for the area. I'm not sure yet what date, or what source, the imagery comes from, but check back here later for more details. The new imagery is from 2006 according to the new post at the official Google Blog. Google also tells me the imagery comes from the USGS. As I suggested last Friday, I think releasing more current imagery is the best way to address the "hue and cry" over the imagery which Google had released last September showing New Orleans pre-Katrina. Nice job Google! In order to publish the best data possible, we must take into account a combination of factors including imagery date, resolution, and clarity. The latest update from one of our information providers substantially improved the imagery detail of the New Orleans area. The detailed imagery was taken before Katrina. In fact, even with the free version of Google Earth you can get the network link for post-Katrina imagery (from the web page they provide) and see the overlay of all the images available. Click on the colored placemarks, which show the hundreds of photos available) and you can download images for the area you want to see - including New Orleans (the screenshot here shows the stadium). 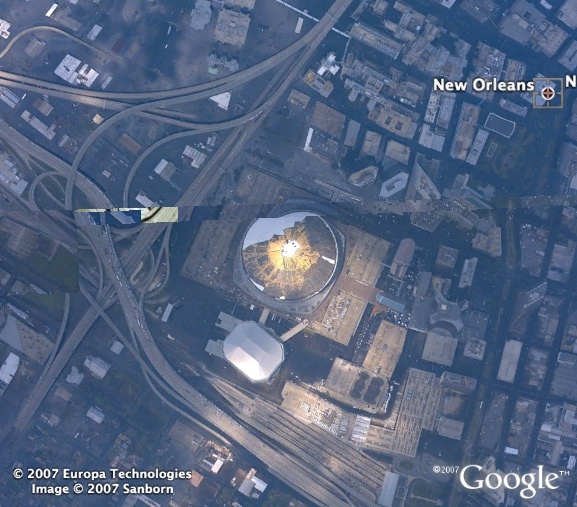 Google was given great credit by the media for its efforts after Katrina for georeference thousands of aerial photos taken by the government and making it available within a day or two after the Hurricane struck. It was a great aid to the efforts of officials to help rescue countless people, and to establish initial damage estimates. Although it probably wasn't the best decision to replace the imagery with pre-Katrina, it's not like the post-Katrina photos weren't available.